And, it happened yet again. Trolls in the mask of religious hooliganism created a ruckus on Twitter, and defamed Myntra for something they didn’t even create or commissioned. #BoycottMyntra was suddenly trending on Twitter yesterday for a harmless and humorous cartoon created by an online creative group, which had Myntra’s logo on it. So called protectors of Hinduism jumped into the battle to defame a multi million dollar fashion portal, for no fault of theirs. ScrollDroll, which is an online portal run by a ‘bunch of creative folks’ from Delhi created few humourous cartoons depicting Hindu Gods and Goddesses, way back in the month of February. Taking the theme of online shopping, they had used logos of Myntra, Flipkart, Zomato and other portals, showcasing some funny scenarios portraying Hindu Gods. The cartoon depicts a scene from Mahabharata, wherein Dushasana is trying to disrobe Draupadi , and Lord Krishna saves her dignity by making the length of the saree infinite. 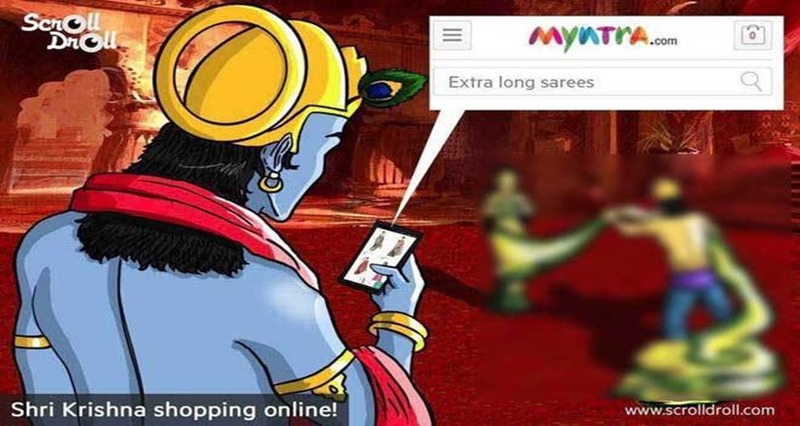 In the cartoon, Lord Krishna is shown ordering extra length saree from Myntra. The tweet became viral, having hundreds of retweets and likes, and was picked by religious trolls, who started a hashtag #BoycottMyntra, which trended for whole day on August 26th, 2016. Some bizarre, and threatening tweets were sent to Myntra, defaming them, and encouraging others to uninstall their app. Meanwhile, after the ruckus and the viral tweets, ScrollDroll, the original creator of these cartoons clarified that it’s their creation, and they even issued an apology for hurting sentiments of people. By afternoon, they tweeted, “We apologize and deeply regret if any of our artwork has hurt the sentiments of anyone.”. Besides, ScrollDroll also made clear that Myntra has no part in this humor, directly or indirectly. By evening, enough damage had been done to Myntra, as even they had to make a clarification, although there was no ‘fault’ of theirs. They said that neither they have created this cartoon, nor they endorse the idea. This is a clear cut case of religious intolerance, and low IQ from trolls, who couldn’t differentiate wit from insult; and have certainly no understanding of the World’s oldest religion which has neither an origin nor an end. Even if Myntra did commission these creatives, as part of marketing outreach, is Hinduism so weak that it will get offended by little bit of humor? Should everyone start uninstalling Myntra’s app, just because they portrayed Hindu Gods in their cartoons? Do share your thoughts by commenting right here. "Religious Hooliganism Humiliates Myntra For A Cartoon They Didn’t Even Create; #BoycottMyntra Trends For Whole Day", 3 out of 5 based on 5 ratings. Well sir, can you try something like this or even closer so on any other religion ? Then you may define a different jargon for that! Just like the “secular” Congress and others do so. Remember the cartoon, and its aftermath ? Wondering why such trolls are always against one particular group ? Because they are the tolerant fools ? If I had taken a direct look at this cartoon, I might have laughed it off. But it is the educated stupid minds like yours who attach special meaning to these. Spend some time with yourself first sir!